A mobile exhibition stand attends agricultural shows and equine events to reach a wider audience and raise funds through merchandise sales. 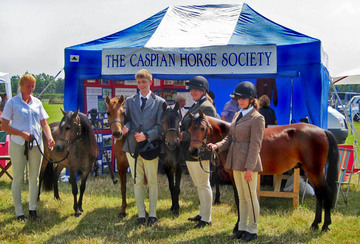 The Society maintains registers of pure and part-bred Caspians and is a founder member of the International Caspian Society which compiles the International Stud book. *New Central Equine Database*: Caspian passport holders please note: the CED went 'live' in April 2018. Go to www.equineregister.co.uk and register your interest. You will be able to find your horse and check the details are correct. Post Referendum: DEFRA tells us that EU regulations, ie passports and Central Equine Database, will continue unchanged for at least another year. It is too early to know any future plans. CASPIAN BREED SOCIETY PASSPORTS ​- the CBS is no longer in existence. CHS has taken over the administration of existing CBS issued passports: see Registration Passports and Stallion Licensing page for details.